Dr.V.Kannan, Vice principal, Member of Central Council of Homoeopathy has presented here his concept and experience elaborately. His name is popular among the students for his best teachings in anatomy and also spelled by the public for his clinical out put. He has presented many articles in various scientific Journals. The topic psoriasis was his thesis for his post graduation. Psoriasis, the mixed miasmatic combined complex disease needs deeper understanding. Usually we focus our attention on outward manifestations and treatment is based on the symptom similarity. psora will be the most outstanding in the symptom totality in the earliest manifestations. This manifestation must be treated first; then after that is eradicated or considerably lessened, the next most potent dyscrasia, as it expresses itself in the symptomatology, must be treated , until this too, is eradicated. The treatment should continue in this way, each time treating the most dominant stigma, as expressed by the outward manifestations until cure is established. We are fortunate that many of our most deeply acting remedies have the ability to meet and deal with more than one of these deep underlying conditions; therefore it is not always necessary, if a remedy be carefully selected, to zigzag a chronic case toward cure. Nevertheless, our treatment must always be based upon the totality of the symptoms as they manifest themselves. Usually in this union of psora and syphilis the psoric symptoms predominate, here the predominant symptoms of psora must be treated first with the antipsoric simillimum, for the syphilis is largely hidden and we must strive to help the vital force to throw off the greater and more predominant incubus which the patient manifests. After the patient responds to the remedy by a decided improvement in the conditions first prescribed for, and the psoric condition is largely obliterated, we must change our tactics, for then the syphilitic dyscrasis will show itself and become prominent, then the symptoms must be met with the antisyphilitic simillimum or the remedy that is most similar and adapted to syphilitic symptoms, to which we will be guided by the similitude of the remedy. A 42 years old field worker of Salem Corporation consulted me for his skin complaints, suffering since two years. 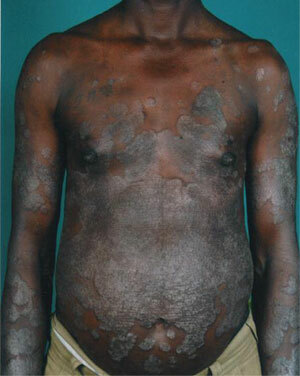 He presented the typical psoriatic lesions with severe scaling and thickening of skin. Initially they started on the back of fore arm, on low back, and below umbilicus over abdomen. He had severe itching with burning <winter, mid night > applying warm water. 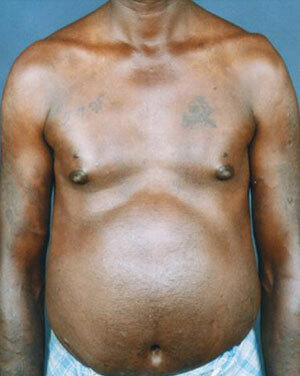 He was hale and healthy from childhood, No history of suppressions, skin diseases or asthma. He had occasional fever with cold and cough and no major illness. His father is a diabetic and mother is hypertensive. No familial diathesis for skin complaints. Initially he had allopathic medicines; and of late he had chosen homoeopathy. His appetite was poor : had burning thirst for cold water; non vegetarian and desires alcoholic drinks. His mental state is irritable; often thinks that it is useless to take the medicines ; chilly patient. There is much improvement and now the skin is absolutely normal. Medication stopped and the patient was requested to report once in three month. No recurrence so far. Natrum mur cured her mixed miasmatic state.